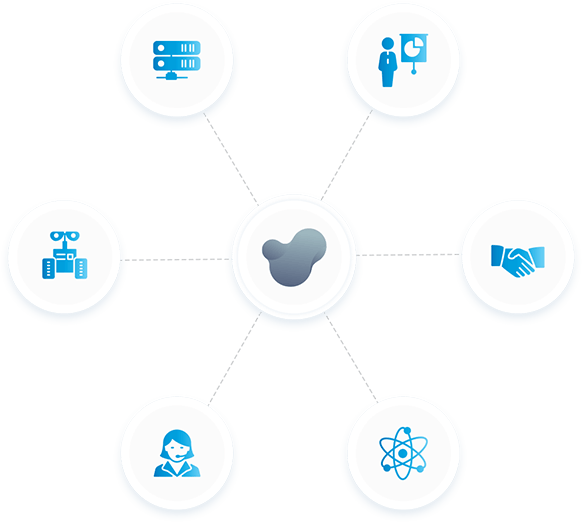 Our solution for analyzing and processing your machine data. Universal, automated, and across different locations. Open up the potential of you machine data. Universal machine connection – even for machines that are not smart. Secure data transmission between the machine and the SCS cloud. Secure, process, format, and evaluate your machine data. 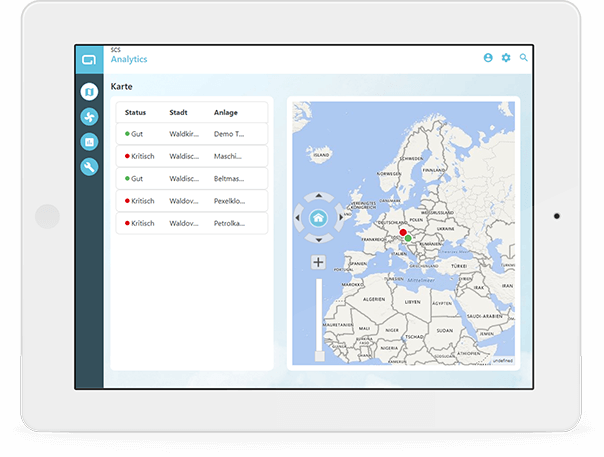 Smart and Networked: Extract Even More Data. Network Business Processes and Production. 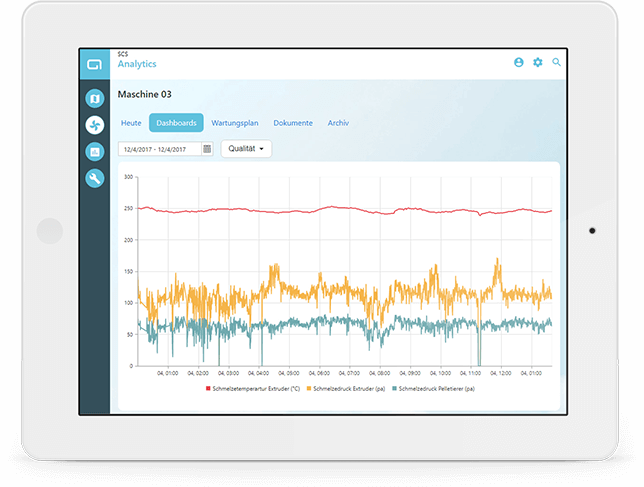 SCS analytics connects the world of machines with the world of ERP. The metadata that is stored in the ERP system turns pure operating data into meaningful information for your production facility. Preparation for analysis and follow-on processing included. An Overview of Your Installations. Any Time, Anywhere. Keep an overview. How productively are your machines working at your individual locations? Where are any problems occurring? The intuitive map view shows you the current status of your production chain. Structured and at a glance. Informed Business Decisions Based on Real Data. You determine how you want to use the operating data that is recorded for your company. 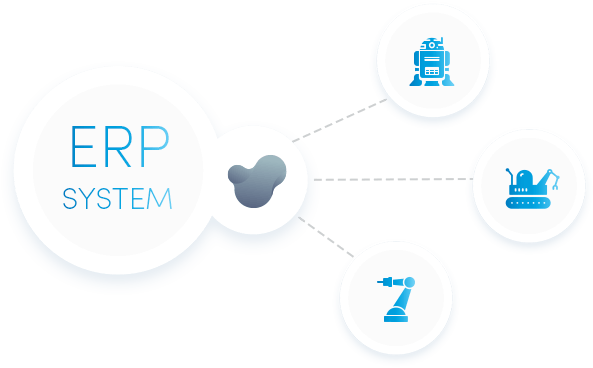 Whether in product management, sales, marketing, or in the field of research and development: the wireless connection to your ERP system means that every department – depending on their authorization – can use the machine data that is relevant to them. 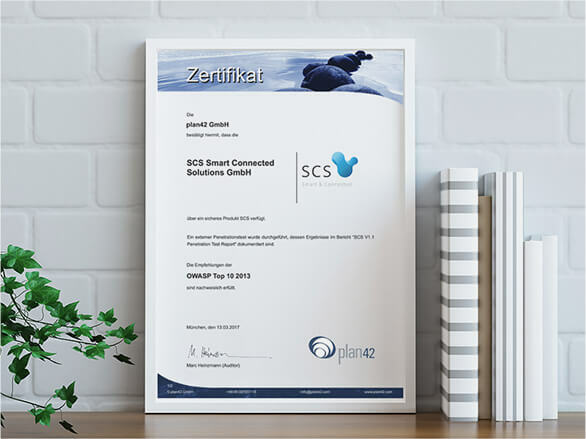 Your customers can also benefit from the data, since with SCS connect you offer them the ability to integrate it into their own business processes. Certified Security for Your Data. Your data is transferred encrypted to the SCS cloud where it is stored securely. SCS demonstrably meets the requirements of the OWASP Top 10 project for 2013. This is verified by Plan42, who have certified SCS by means of an external penetration test. Let Your Machines Do the Talking. 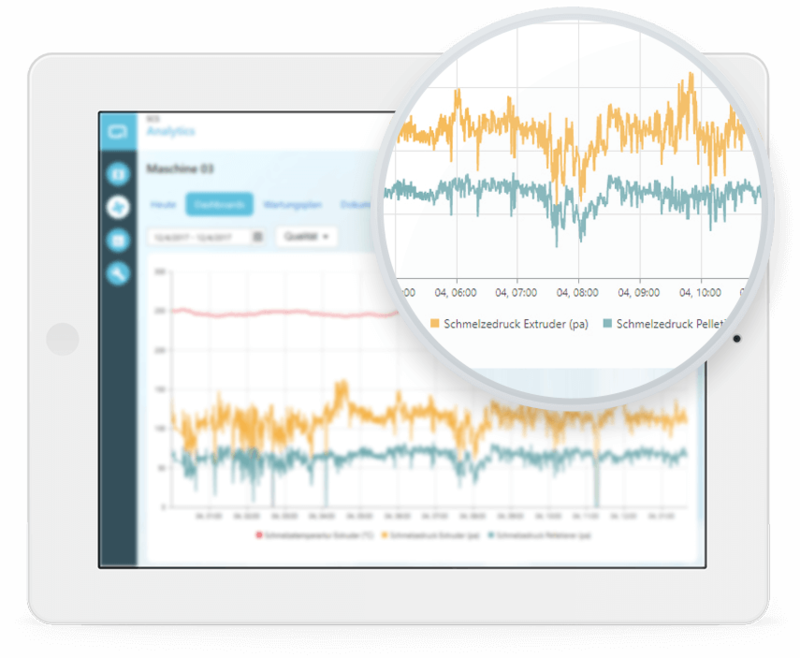 SCS analytics processes the heterogeneous sensor data from your machines in real time. This can be evaluated and correlated to the data from other machines. The SCS analytics app visualizes the result. 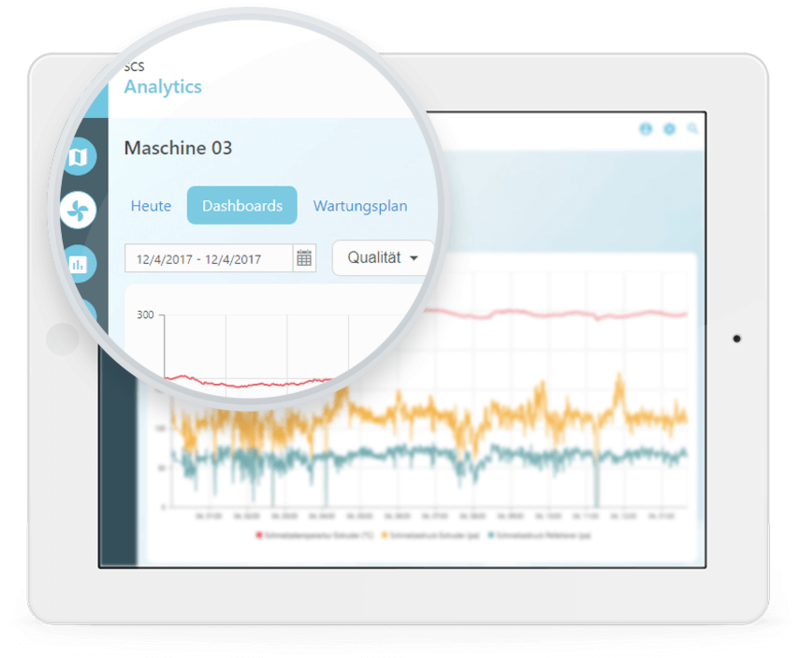 At the same time, the system determines whether and how the threshold values of the sensors were exceeded – using the latest stream analytics technology. If there is any danger, you will be notified immediately via SCS connect. 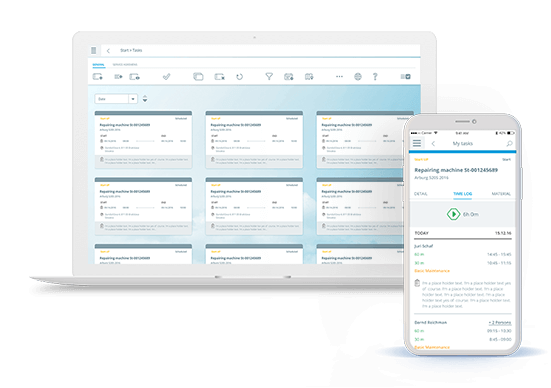 Preventive incident management made easy: on request, SCS automatically initiates a maintenance operation in your ERP system that your planners can quickly and easily confirm in the connected SCS planning system. 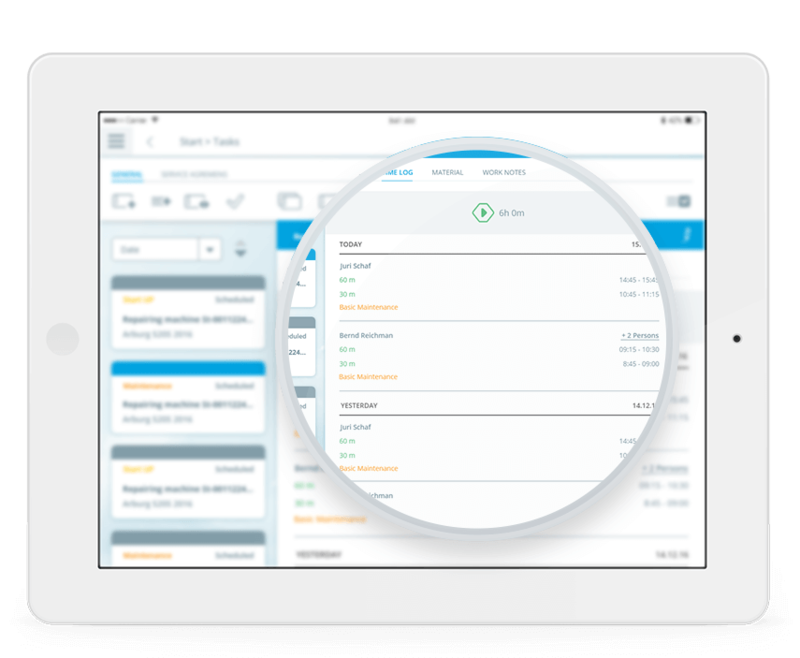 On site, our mobile SCS app provides service technicians with all relevant and optimized data about the service operation. With SCS analytics Into the Connected Future.